VANCOUVER - A young woman from East Africa had lived a life of hardship and poverty before meeting the employer who eventually brought her to Canada and allegedly forced her into domestic servitude, a human trafficking trial heard Wednesday. 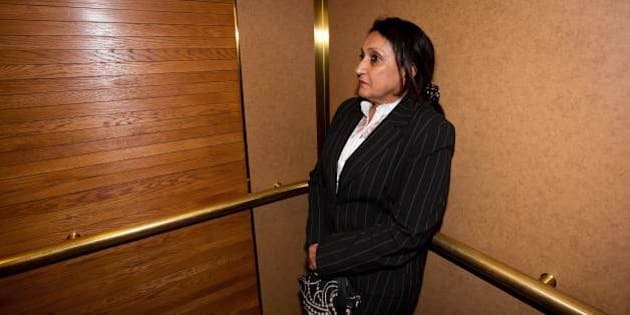 The employer, 60-year-old Canadian citizen Mumtaz Ladha, is facing several charges, including the human-trafficking of the 26-year-old Tanzanian woman who cannot be identified under a publication ban. The alleged victim, wearing glasses and a black outfit, testified at B.C. Supreme Court on Wednesday that she began working as a housekeeper for Ladha in Dar es Salaam, the largest city in Tanzania, when she was about 14 years old. The court heard the young woman grew up with her two older siblings and parents in a house with running water and electricity. But her father, a shop owner, died when she was three years old, so the family of four was forced to move into a single bedroom in a house, had to use candles and fetch water from elsewhere, she said through an interpreter. The woman said her mother supported the family by working at a hotel, so she was able to complete elementary school and then train to be a nurse. But her mother died in 2002, forcing the woman to quit school. "Nobody was looking after us," she said, tearing up. She then started working for an African family, caring for their child, before finding a job as Ladha's housekeeper, whose home was located in an area where "there are big houses, and rich people live there," she said. When asked by Crown prosecutor Peter LaPrairie about her work schedule there, the woman replied she would work from 7 a.m. to five or six in the evening, six days a week for the equivalent of $50 Canadian a month. She was also expected to spend one night at week at Ladha's home, where she said she would work into the evenings and then start work again first thing the following morning. The woman said she stopped working for Ladha as a housekeeper in 2005 because she had a baby. But she later sought employment again in the wealthy neighbourhood where Ladha and her family lived, and even bumped into her Ladha one day. "She told me to give her my phone number," the woman testified. "She told me she could give me a job." The woman said Ladha offered her a job as a cleaner at her salon. But she eventually picked up other skills and started performing pedicures, manicures and massages. Ladha was "very happy" when she found out she was improving her skills, the woman said, and even gave her a raise, but she was still paid less than what other salon staff made. The Crown is alleging the woman was eventually lured by Ladha — who splits her time between West Vancouver and Tanzania — to Canada in 2008 with the promise of a six-month job in a salon that would pay her $200 a month. However, the salon job never materialized and instead, the woman was forced to work long hours in Ladha's affluent West Vancouver home for no pay and no means of escape, the Crown alleged. The woman eventually fled to a shelter in June 2009 with the help of Tigist Begashaw, a community health worker who also testified Wednesday. Begashaw told court she met the woman in early 2009 at a bus stop. The two then met three or four different times after that. During the meetings, the woman told Begashaw about her living and working conditions, and that she couldn't go home to Tanzania because her passport was withheld from her. Begashaw said she gave the woman food and money because she said she was hungry. "She was sad," Begashaw said. "Every time I talked to her, she was in tears." While Begashaw did not, at the Crown's request, disclose details about their conversations, she said she initially felt skeptical about the woman's story, prompting defence counsel to suggest the woman was really trying to con her out of her money. "Would you at least agree that scenario is a real possibility?" Eric Gottardi asked Begashaw. Begashaw said she eventually suggested the woman seek help at a shelter. The woman did so, and the police later visited Ladha's home to retrieve the alleged victim's belongings and passport. Ladha has pleaded not guilty to four charges under the federal Immigration and Refugee Protection Act: human trafficking; employing a foreign national without authorization; misrepresenting facts to the High Commission of Canada in Tanzania; and misrepresenting facts to Citizenship and Immigration Canada.